If you didn’t read that headline in a sing-songy Mariah Carey voice, you did it wrong. Go back and try it again. All of my favorite blogs and magazines have been posting holiday gift guides and I can’t get enough of them. I read ’em all, even the ones that don’t apply to me: gifts over $250, gifts for your unruly toddler, gifts for your totally sane parents. I love going through them and seeing all the cool stuff that’s out there, and I’ve even snagged a couple of ideas for presents I’d like to buy for a few people on my list. With that in mind, I put together a little holiday gift guide of my own. Now, this isn’t necessarily MY specific wish list, more just like a few fun, food-related presents (that I also would totally not be mad at finding underneath my Christmas tree). Cough cough. *Cheese of the Month Club from Murray’s Cheese: I’ve seen this one on a few lists and well, it’s because it’s amazing. Murray’s (i.e. my happy place) sends you three different cheeses to have at home, and it can be a one-time thing or a subscription to last however many months you want. *Whole wheel of Parmigiano Reggiano: Ok, now hear me out. I know this one’s a big-ticket item but seriously, this is the stuff dreams are made of. *Christmas doughnuts from Doughnut Plant: You’d have to either be a diabetic or just the Grinch himself to not love one of these adorable, festive doughnuts. Choose from the coconut snowman, the mint chocolate Christmas tree, or the gingerdough man. Or better yet, get all of them. Oh and throw in a creme brulee doughnut too, cause those are the best. *Marseille Amaro from Forthave Spirits: Not only is this distilled in Brooklyn, which gives it extra cool points, but amari are everywhere these days and a great addition to any bar. I’m putting this one on my to-buy-for-myself list. *The Best American Food Writing 2018: It’s not all about what you can consume with your mouth, you know? Sometimes you gotta feed your brain too, and find a little inspiration from really great food writing. *Fig and chocolate panettone: regular ol’ panettone is already one of the best parts of the holiday season, in my humble opinion, but one made with figs and chocolate? C’mon! Think of the french toast you could make with that! And you don’t even have to wrap it since panettone already comes in its own showy wrapping. *Good olive oil in a cool tin container: After watching the first episode of Salt, Fat, Acid, Heat on Netflix recently, I was reminded of the awesome olive oil they have in Italy and how I want to be the kind of person who only keeps the good kind around, the really bright green, peppery, fresh stuff that you’d keep in a cool, rustic-chic tin container like this one. *Food of the Italian South, by Katie Parla: Part cookbook, part coffee table book, part travel inspiration, this book isn’t actually available until March but you can pre-order it now. When better to get a present than when you’re least expecting it, like no-holidays March? The best thing about having an Italian boyfriend is that his standards for Italian food are ridiculously high. He would rather eat a sock than dinner at the Olive Garden, never buys pasta sauce in a jar, splurges on “good” olive oil, and like me, he thinks that alfredo sauce is weird and gross. Tonight for example, he wanted to make pesto. 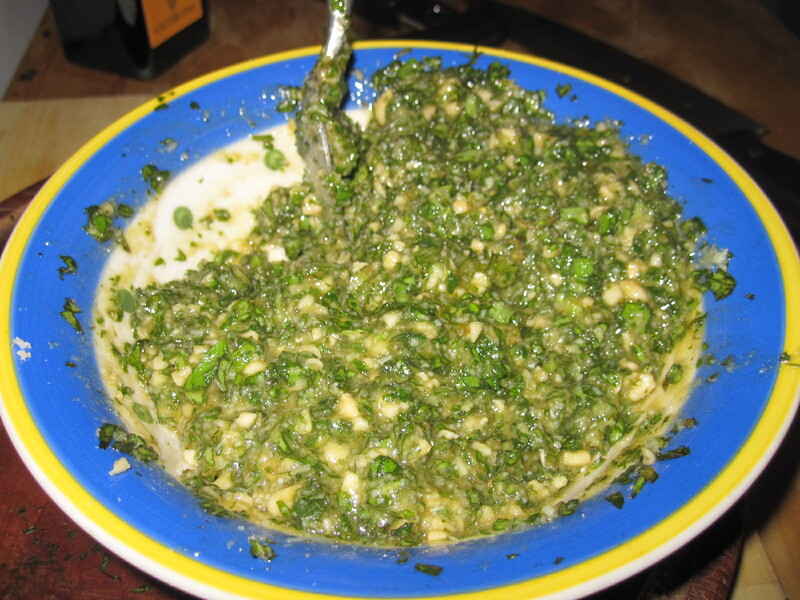 Great, I thought, I love pesto! 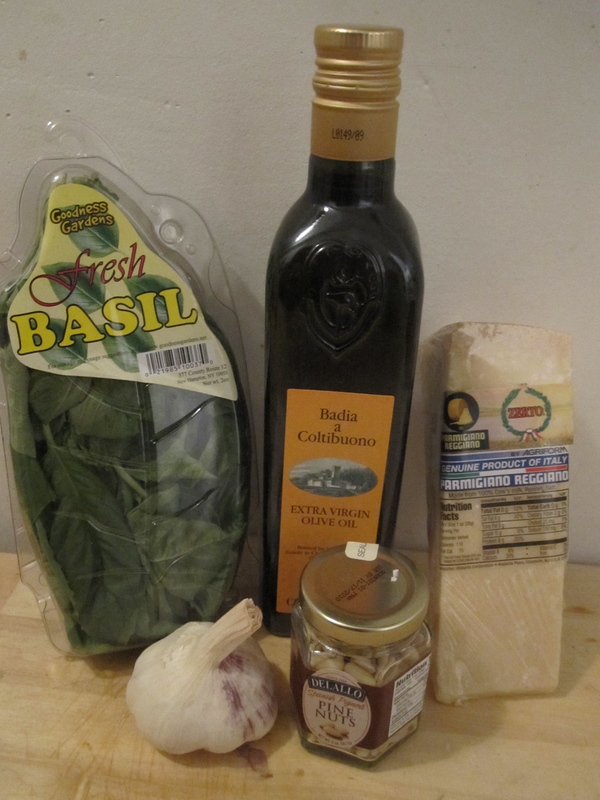 So off he went to the supermarket down the street but instead of coming back with a small jar of the oily green stuff most people would’ve bought, he came back with a wedge of Parmiggiano-Reggiano (aka Parmesan), a fat head of garlic, fresh basil, pine nuts and olive oil (Italian of course). Apart from grating the cheese and documenting this whole process with my camera, I didn’t really do much. I observed and was greatful. That was about it. Flaneur on the other hand, got to business. 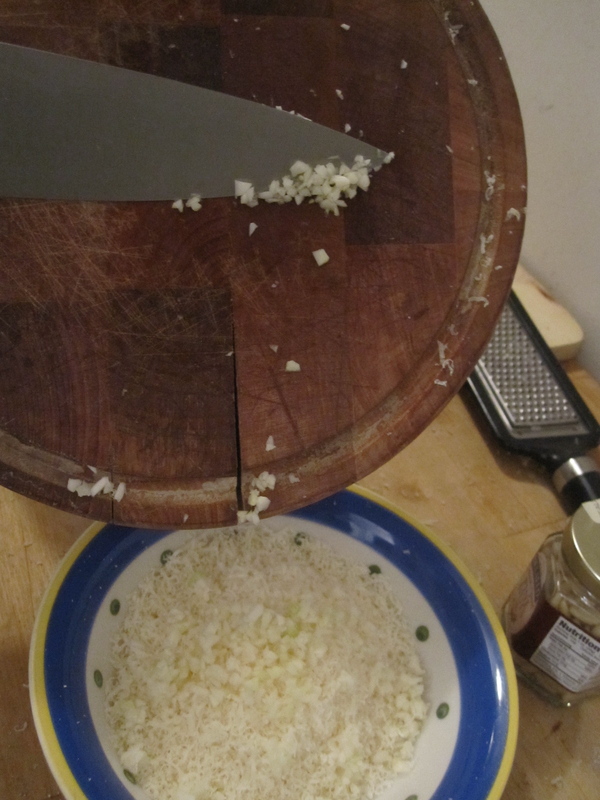 He finely diced a couple cloves of raw garlic and added them to the bowl of grated Parmesan I had finished. Next, between tossing several of them in his mouth and marveling at how good they were (even though they were from Spain), he chopped up the pine nuts and also added those to the cheese and garlic mix. 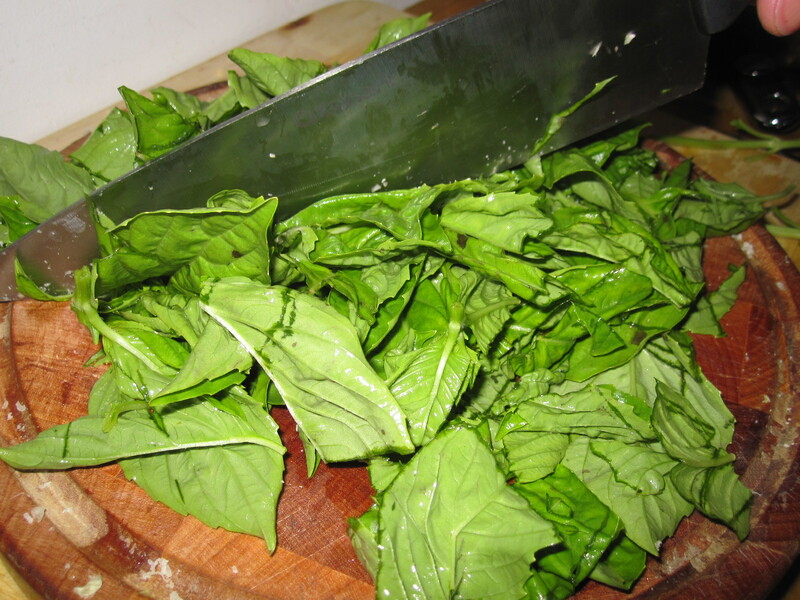 Up next were the basil leaves, which he plucked off their long stems and minced with the sharpest knife my small kitchen had to offer. 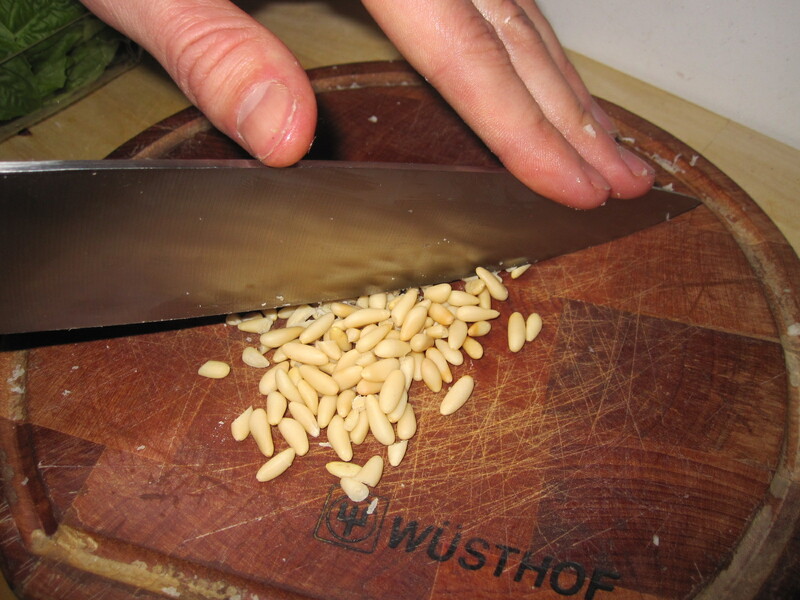 Once the basil was chopped into small enough pieces it went in with the cheese, garlic and pine nuts. Finally, he cooked the pasta, De Cecco fusilli (his favorite brand and the only one he eats at home in Italy). After draining it he threw it back in the pot, mixed in the pesto and served it. 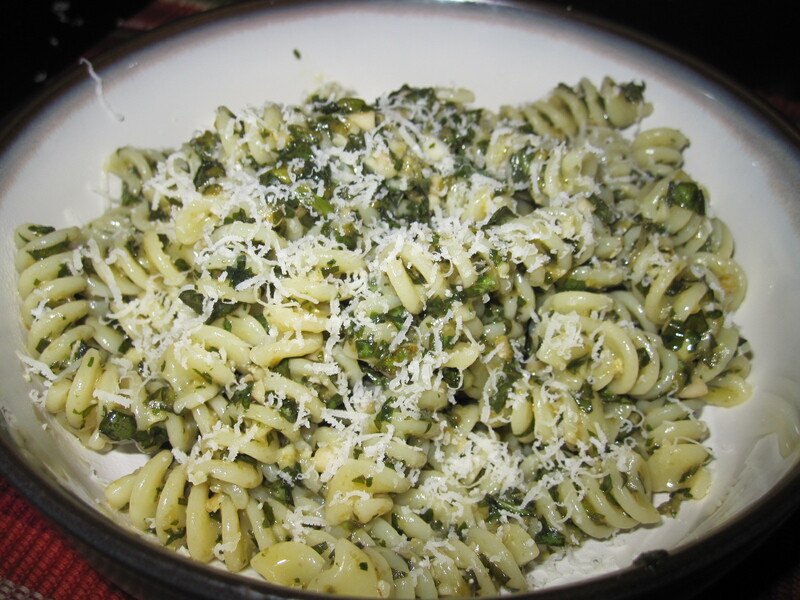 We sprinkled on some more fresh-grated Parmesan and sat down to enjoy our delicious pasta with authentic homemade pesto. Mmmm mmm!